Proprietary Name: Basic Care Daytime Cold And Flu Severe What is the Proprietary Name? Non-Proprietary Name: Acetaminophen, Dextromethorphan Hbr, Guaifenesin, Phenylephrine Hcl What is the Non-Proprietary Name? 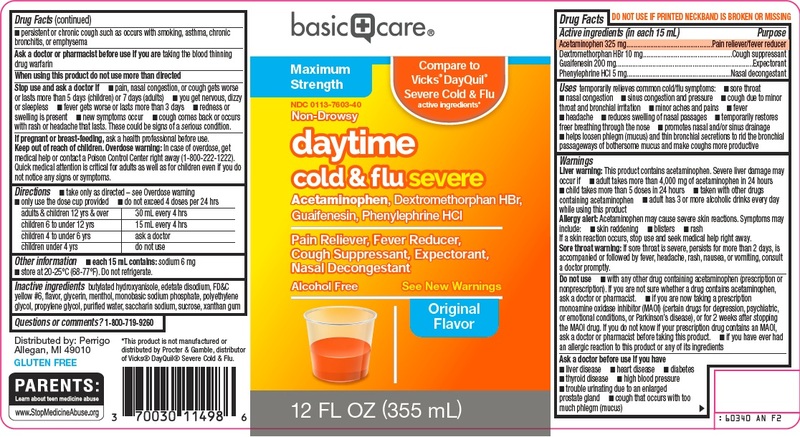 Basic Care Daytime Cold And Flu Severe with NDC 0113-7603 is a a human over the counter drug product labeled by L. Perrigo Company. The generic name of Basic Care Daytime Cold And Flu Severe is acetaminophen, dextromethorphan hbr, guaifenesin, phenylephrine hcl. The product's dosage form is solution and is administered via oral form. Liver warning: This product contains acetaminophen. Severe liver damage may occur if •adult takes more than 4,000 mg of acetaminophen in 24 hours •child takes more than 5 doses in 24 hours •taken with other drugs containing acetaminophen •adult has 3 or more alcoholic drinks every day while using this productAllergy alert: Acetaminophen may cause severe skin reactions. Symptoms may include: •skin reddening •blisters •rashIf a skin reaction occurs, stop use and seek medical help right away.Sore throat warning: If sore throat is severe, persists for more than 2 days, is accompanied or followed by fever, headache, rash, nausea, or vomiting, consult a doctor promptly. •you get nervous, dizzy or sleepless •pain, nasal congestion, or cough gets worse or lasts more than 5 days (children) or 7 days (adults) •fever gets worse or lasts more than 3 days •redness or swelling is present •new symptoms occur •cough comes back or occurs with rash or headache that lasts. These could be signs of a serious condition. •each 15 mL contains: sodium 6 mg •store at 20-25°C (68-77°F). Do not refrigerate.